The kitchen is the social hub of the home, and the epicenter of important family decisions. When I was a community organizer, I would knock on doors and ask people if they had a minute to talk. I knew I caught their interest when they invited me into their kitchen. If they offered me something to drink, I was even happier, because that meant that they had time for a real discussion. My goals, in order, were to get invited in, get into the kitchen, get a cup of coffee, get them to engage meaningfully, get them to join the organization. Once I was in the kitchen, usually everything else followed. Where is the virtual kitchen? Where do online stakeholders hang out socially? Time, I believe, is the key metric to use when seeking the “kitchen.” Social networks, I believe are the kitchens: they are the social hub of the internet, and where people get information they trust to make important decisions. Therefore, I think of the metric thus: time spent on social networks overlaid with demographic information about each network. The chart below, compiled by Hitwise, offers fairly recent information on US trend. A good comparison to this would be the slide show offered here, using ComScore statistics, that analyzes time spent on the top ten social networks from July 2006 to July 2007. If I were developing a communications strategy, I would cross-reference my target populations’ demographics with analysis of time spent on social networking sites. For example, if my organization were running a youth group, we would be interested in MySpace, YouTube, PhotoBucket, and Facebook. However, if we were interested in asking Baby Boomers to advocate for legislation, then we would most likely connect with them through a friend-finding site like Classmates.com or a professional network like LinkedIn. This chart compiled by Rapleaf is a great resource for identifying the age and gender of social network users. When you want to find your stakeholders, and really engage, you want to be in their kitchen, the virtual portal where they spend the most time. You want to be in the place where they are spending their time socially online, sipping their cups of coffee. 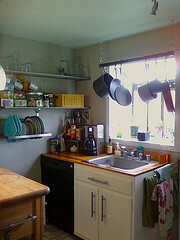 Hopefully, this post helps your organization find your stakeholders’ kitchens. Enjoy the coffee!